Another year has passed, and it seems Operation Santhanam — that’s trying to convert the comedian into a hero — is still ongoing. 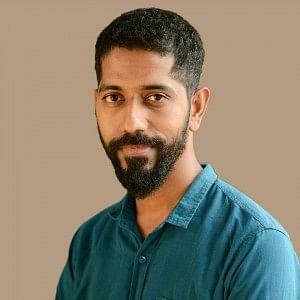 His last film, Sakka Podu Podu Raja, didn’t exactly achieve this, and almost a year and three months after its release, he returns with a sequel to Dhilluku Dhuddu, which got released at a time when horror-comedies had already started looking out of their depth. At a time when the genre has all but died an ungraceful, extended death, this sequel tries to bring it back into fashion… rather unsuccessfully, and with little novelty. Some gags work, some lines are funny, many are offensive… and for the most part, the film’s just tiresome. Perhaps on account of this film being a sequel, it bears quite a few similarities to the original. The idea of the ghost getting locked up and accidentally released. The idea of a few charlatans who masquerade as powerful people. The idea of an extended end where everyone has to deal with the real ghost. And of course, at its heart, it’s still trying to use the comedy potential of the genre to try and ease Santhanam into the role of a hero. In reviewing films like this, the real question is, are the jokes funny and consistently so? Well, not really. Firstly, they are not particularly inventive. There’s a lot of the ‘insult comedy’ that Santhanam is well-known for, but our writers really need to understand the difference between punching up and punching down. In this film, director Rambhala, sadly, picks some familiar, vulnerable targets: Effeminate men, short men, women… Some of us have shouted ourselves hoarse about why punching down isn’t funny, but apparently, it’s not being heard yet. Rajendran’s face gets called an ‘alien moonji’. When his character taps the posterior of a woman, and she reacts with outrage, Viji (Santhanam) asks her to take it easy, because if Rajendran actually meant to do it, he would have chosen a more attractive woman to do it to. A short man keeps scampering, and Viji uses up every opportunity to mock his height. He calls him a frog, and later asks if he’s running from a bandicoot. In fact, they even shoot a rat chasing him. Bullying. Isn’t. Humour. There are places though where Dhilluku Dhuddu 2 shows it can be genuinely funny. Like when Viji wonders why doctors always respond to a patient’s complaint about pain by tapping the affected area and asking if it hurts. Like when it exposes a couple of charlatans. The film’s best joke, in fact, is its most innocent, when two men at opposite sides of a door keep pushing it, assuming there’s a ghost on the other side. With such talent for writing humour, it’s impossible not to wonder why Dhilluku Dhuddu 2 didn’t strive to be more inventive. While all of this is happening, Operation Santhanam goes on diligently. He gets at least two fight sequences that have him throwing no-look punches, and taking himself far too seriously for a film like this. He gets an opening song that has him beating people up in slow motion. His introduction scene has someone cheekily referring to him as ‘saami’. He gets a ‘love song’ that has him pining and imagining strangers to be the girl he’s cast his eyes on. He almost gets a duet, but the director holds back. Despite all these attempts — and Santhanam looking fairly assured — you’re not at all sure if this film has done much to further his ambition of being a hero. What it does do though is further cement the reputation of bloodthirsty ghosts as funny women wearing abnormal amounts of talcum powder.